Beginning in the fall of 2013 a sub-committee of members from the CMCA Executive Committee began work on the preparation of an application to the Internal Revenue Service that would permit our association to be officially recognized by this agency. Seeking official status was recommended by an attorney who met with the Executive Committee and who has worked with groups like ours in this region of Oregon. The pursuit of this status had previously been approved by residents . The members of this sub-committee were Deborah Neal, Charles Ansorge, and Chris Spence. The sub-committee reported regularly to the Executive Committee regarding their progress and their recommendation that CMCA should prepare an application to achieve 501(c)(3) status with the IRS. If this status was achieved it would permit residents of Cape Meares and others to make a donation to the association and receive tax benefits for doing so. The sub-committee determined in the spring of 2014 that in order to make application for 501(c)(3) there was a need for the existing bylaws to be revised. A proposed set of bylaws was presented to those attending the May 5, 2014 Annual CMCA meeting for discussion. Deborah Neal provided an update on the progress the sub-committee had made and stated that bylaw changes were needed before it was possible to submit formal application materials. The changes were to put CMCA in compliance with IRS guidelines for 501 status. Shortly following the Annual Meeting (May 20, 2014) residents of the community were given access to a PDF version of the proposed bylaw changes. Anyone who asked for a paper copy of the proposed bylaws was asked to notify Deborah Thomas Neal. 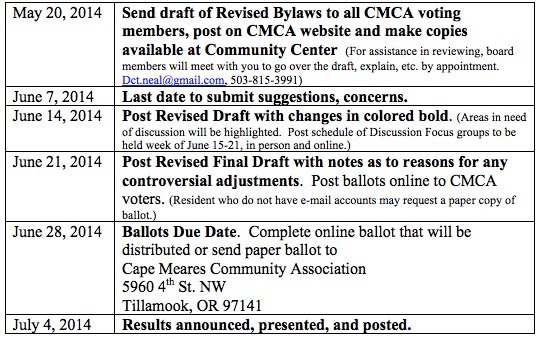 Cape Meares residents were asked to provide feedback to the CMCA Board regarding any concerns regarding the proposed bylaws and offer suggested changes. The process involved and the dates set at the May meeting are outlined below. A substantial number of suggestions were offered to improve the revised document, but there were no serious concerns expressed by residents regarding any of the proposed revisions. Focus groups had been planned for the week of June 15-21, but because there of receiving only a minimal number of suggested changes and no serious objections from anyone, the CMCA Board decided there was not a need to have a public forum to discuss the document. On June 21 the final revised document was posted and residents were asked to vote by noon on Saturday, June 28, whether they approved or did not approve of the bylaws. On July 4, 2014, the results of the voting were announced at the community picnic to the approximately 200 residents and guests who attended. Of the 45 who chose to respond to the ballot there were only three who opposed the suggested bylaw changes; approximately 93% supported it. 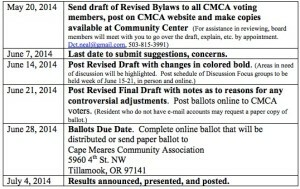 A PDF of the approved CMCA bylaws may be found by clicking on the link found below.